Hi everyone! Today for Meredith’s and my vegetarian recipe challenge, instead of trying some recipes we will be bringing you our own vegetarian power bowls. This week’s challenge recipe was power bowls. Meredith and I looked all over Pinterest, only to come a conclusion: most power bowls are variations of the same recipe. A majority we saw were sweet potatoes, beans (chickpeas or black), avocado, and spinach or kale. Not that there’s anything wrong with that combination, but sometimes you want some variety – especially with a recipe that so easily lends itself to variety. Variety is an essential part of a healthy diet: not only does it keep healthy eating interesting, but nutritional variety is essential for preventing deficiencies. Sweet potatoes, avocado, kale, and chickpeas are very nutritious foods, but you can’t live on only these foods. Be sure to check out Meredith’s power bowl recipe and guide! You simply combine vegetables, protein of choice, a grain or starch, and healthy fats for a balanced, nutritious, no-fuss meal. You can prep the ingredients ahead of time if you need. These meals are budget-friendly since you can adapt them with seasonal produce and whatever grains, nuts, or protein were the best price this week. Variety: again you adjust with the seasons or what you’re craving that week. They’re easy to pack for the office or classroom. Eating out of a bowl is more comforting than eating off a plate – and who doesn’t want their lunch break to be relaxing? I practically lived off power bowls for my grad school lunches before I even realized that power bowls were such a thing (although I was addicted to Pinterest even back in 2013, so power bowls probably snuck into my subconscious). I needed nutritious meals that fit my paltry budget and on-campus-for-hours schedule. At the start of each week, I’d cook a large batch of sweet potatoes or brown rice, roast some vegetables, and then add chickpeas or hard boiled eggs. Each morning I’d pack a serving of each together in a container, stash it in the fridge in the graduate assistant office, and have a quick and healthy lunch that was much cheaper than eating on campus. I still eat power bowls for lunch most days. My meals follow a routine to make healthy eating simple: oatmeal with chia seeds, egg, and fruit for breakfast; a vegetarian power bowl of some variety for lunch; and chicken or fish for dinner with rice, potatoes, or squash and vegetables. It sounds boring, but there are so many varieties of power bowls to choose from that even those who cannot tolerate leftovers will enjoy them. I do very minimal meal prep, but I do try to be efficient with the time I spend cooking. If I cook rice or quinoa I will make it in a large batch, and usually I hard boil several eggs at once for lunches. Make quinoa, amaranth, brown rice, or other grain of choice in a large batch and store in the fridge. Chop squash, potatoes, and other vegetables ahead of time, especially if you’re already cutting vegetables for dinner one night. Hard boil a large batch of egg or cook up a large batch of lentils. If you want, divide the meals into separate containers ahead of time or assemble the power bowl the night before. The ratios are simple: choose a grain and/or starchy vegetable, a vegetarian protein, healthy fats, and then add whatever vegetables you desire. Get some ideas from the graphic below! Toss the butternut squash with olive oil, smoked paprika, and sea salt. Spread flat on a roasting sheet lined with parchment paper and bake for 40 minutes or until fork-tender. Meanwhile, combine the stock or water and quinoa to a boil. Cook for 15-20 minutes, or until the water is absorbed. Remove from heat and cover for 5 minutes before fluffing with a fork. While the quinoa is cooking, place the eggs in a pot and fill with enough enough water to cover the eggs. Bring to a boil, remove from heat, cover, and let cook for 10 minutes. Once the eggs are cooked, remove from the pot and place immediately in a bowl of ice water (this makes the shells easier to remove). Once everything is prepared, make the tahini sauce by whisking together the tahini, lemon juice/water, garlic powder, and sea salt to taste. To assemble the power bowl, serve 1 cup of roasted squash, 1/2 cup of cooked quinoa, and 1 shelled and sliced egg in a bowl (over greens if desired). Drizzle with a heaping tablespoon of the sauce. This meal is ideal for leftovers or meal prepping. You can prep the squash, quinoa, and eggs all separately ahead of time and store in the fridge until you assemble the power bowl. Use what you have on hand! That’s the beauty of a power bowl. Add some crunch (tablespoon of nuts or seeds) for texture. Seasonings matter: sea salt, ground pepper, garlic, smoked paprika, etc. What would you put in a power bowl right now? The Olympics start today – what event are you the most excited to watch? I love the idea of power bowls, the problem for me is vegetarian proteins. I don’t like hard boiled eggs, and beans don’t usually sit well in my stomach. I haven’t tried tempeh or lentils, which honestly just sound overwhelming to buy and make without knowing if I like them. I definitely like roasting veggies and cooking up some rice or quinoa over the weekend to have ready for lunches during the week! Beans often don’t sit well with my stomach either, especially during peak training periods. Quinoa is good because it’s a complete protein! And then if you have nuts/seeds with it, something like yogurt on the side, or add some tuna there’ll be plenty of protein. I’m nervous about trying tempeh also for that same reason. you know, I never thought to add an egg! I don’t eat a ton of eggs but more recently have been – great idea! Thank you! The egg added a lot of extra protein and some more fat to make it even more satisfying – and helps me get those B vitamins! 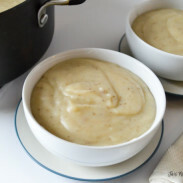 What a fun idea this week’s recipe turned out to be! Power Bowls are my jam even before they had such an awesome name. I eat one practically everyday for lunch. I fill it with leftovers and things I’ve prepped for the week. It works and keeps me satisfied for hours. I had some exquisite roasted carrots and fennel yesterday. I would go nuts on that right now! I’m all about power bowls. 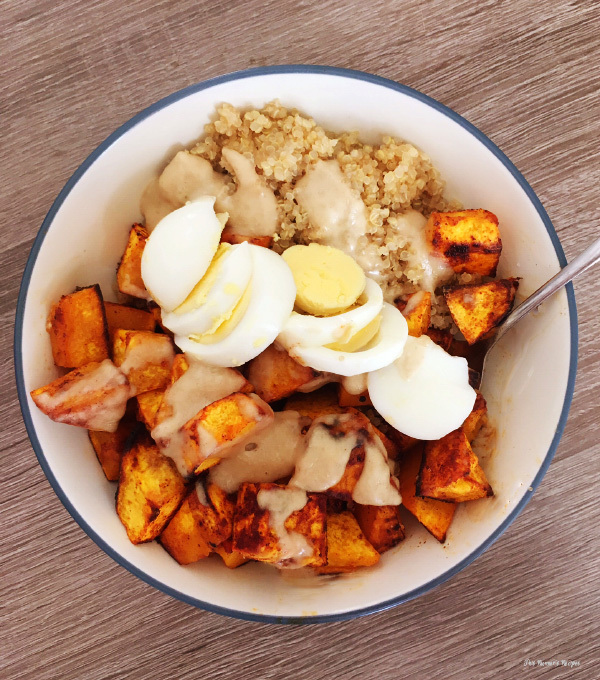 Your butternut squash and quinoa bowl looks AMAZING! You healthy little thing, you! I love the Olympics. I dig the running events and gymnastics. Woop woop! Power bowls are my jam. 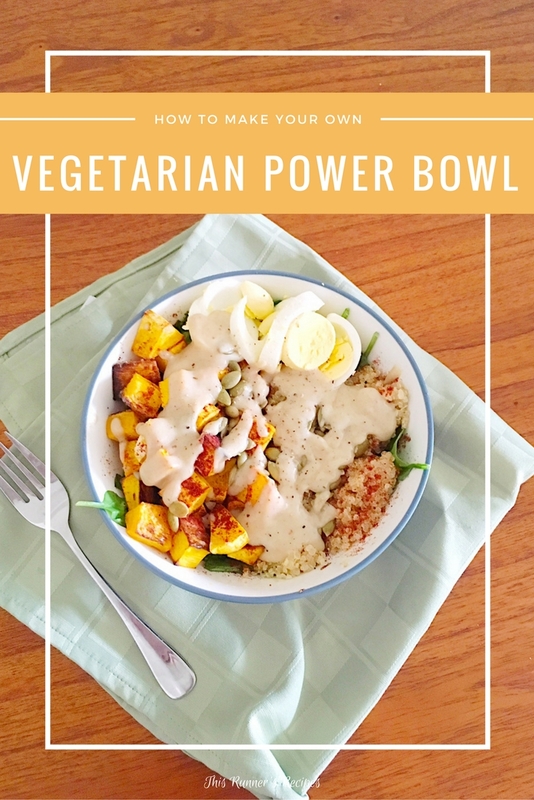 Though I never have called them Power bowls before – now I will! Last night I threw together some kale, sweet potato, roasted corn, black beans and sprouted TJ grain blend with tomatoes, salsa and some greek yogurt with fajita seasoning. 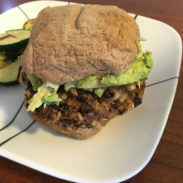 Definitely a little on the starchy side but sooo satisfying 🙂 I love the idea of adding crunch with nuts and seeds – definitely trying that soon! Any suggestions for amounts to make a healthy, balanced bowl? 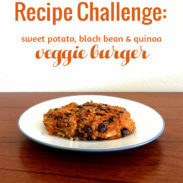 The amounts used would vary based on your caloric needs and activity level – the recipe included makes 4 balanced servings. Ideally, 4 oz. of meat protein or 1/2 cup of legume, 1 cup of vegetables or more, and a serving of grains (which varies based on the type) makes a balanced serving.